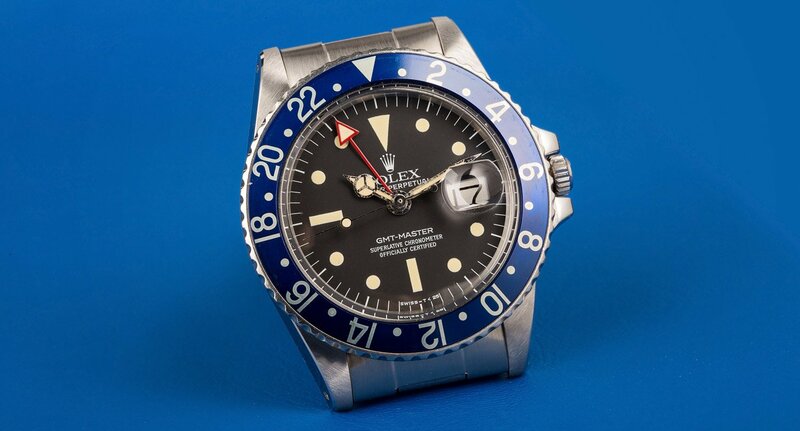 One of the most striking of the Rolex GMT-Master watches was the 1675, produced between 1959 and 1980. Not only did this watch enjoy one of the longest production runs in Rolex history; it also is one of the most easily-recognized because of its beautiful blue and red bezel. Because the Rolex GMT Master 1675, otherwise known as a Pepsi, was produced for such a long time, it is one of the easier vintage Rolex watches to find. However, many collectors prefer an earlier and more worn version than one of the newer models. 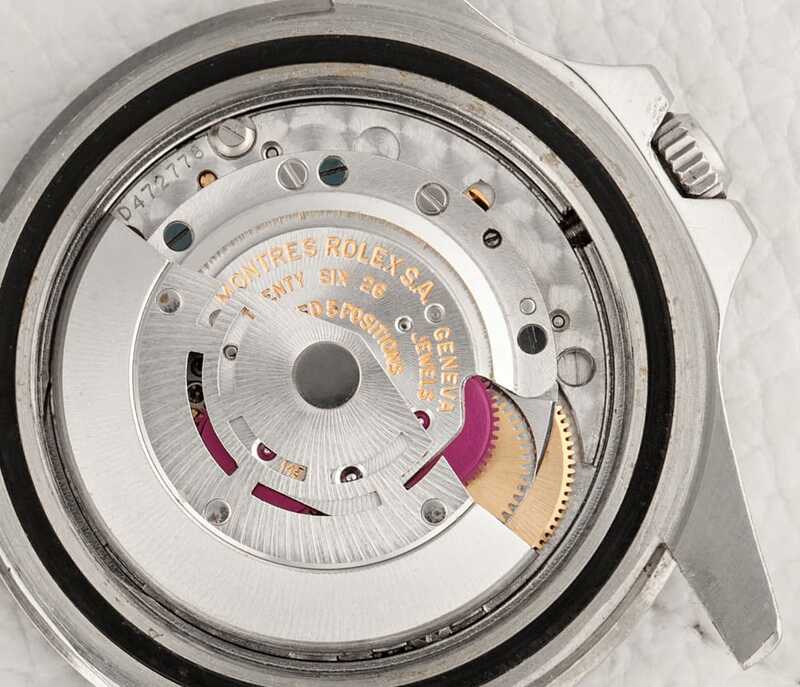 This Rolex movement is an amazing timepiece for its ability to keep track of two places, and for its vintage qualities. For the first ten years of production the Rolex GMT Master 1675 featured a small triangle on the extra hour hand. This was succeeded by a red hand with a larger triangle in the 1970s and is one of the easiest identifying points in helping to date this watch. Earlier models also featured pointed crown guards as well as a chapter ring. 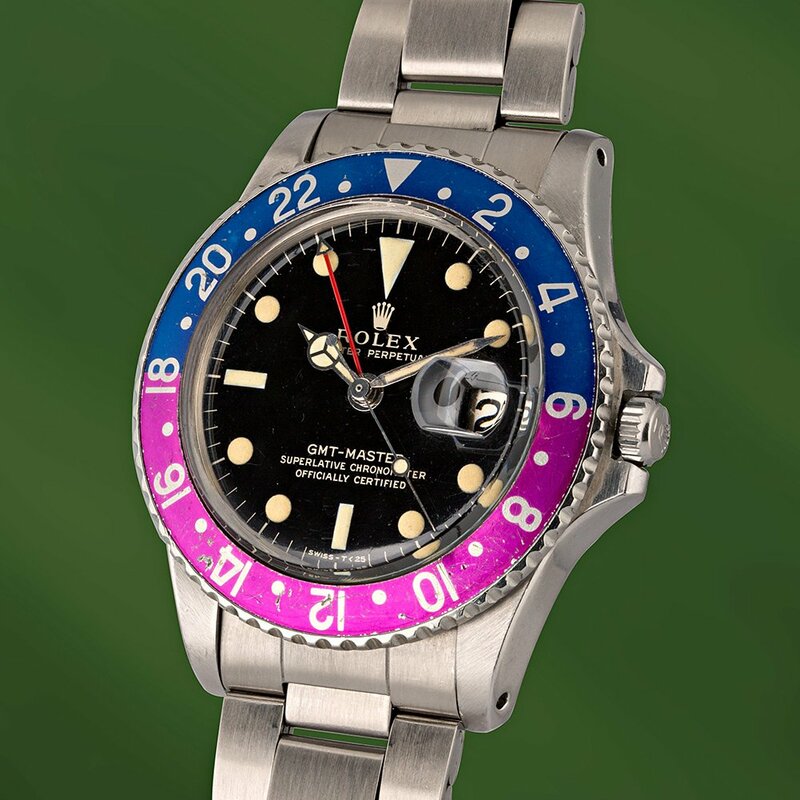 The very earliest Rolex GMT Masters were produced with a Bakelite bezel, but the Ref. 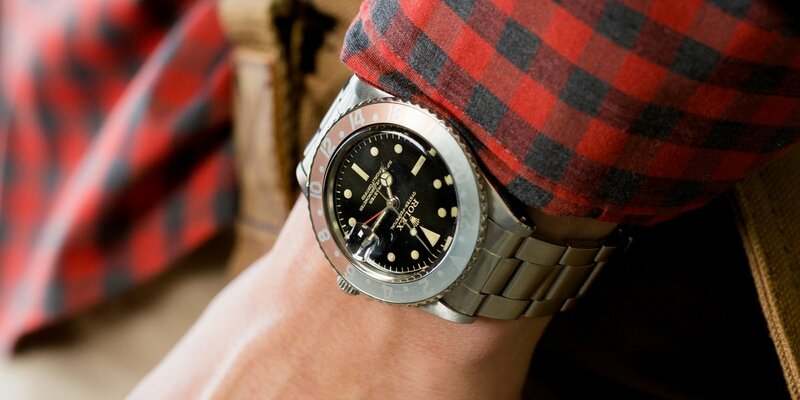 1675 has always had a metal bezel for sturdiness and stability. The Rolex GMT Master was the first Rolex sports watch to feature both the Oyster and Jubilee bracelet styles, and vintage Rolex examples can be found with both types of bands. The dial printing features gilt on the outer ring around the hour and minute marker on the early 1675 versions. Later, when the larger triangle on the 24-hour hand was featured, the printing changed. In 1965, the company changed over to all-white dial printing from the gilt printing. In 1967, the outer ring was completely removed and the pointed crown guards replaced with rounded ones. These are very easy identifying markers in dating a Ref. 1675. The minute markers grew longer in 1969 and, in 1972, the bezel became available in all black. However, it is the red and blue bezel that stands out in the minds of most collectors and has led to the nickname of “Pepsi” for this particular watch. Today, the Rolex GMT Master 1675 with the distinctive two-tone red and blue bezel is a collector’s item that is hotly sought after by those who want a truly distinctive vintage watch. Finding a GMT Master is not as difficult as finding some other vintage models. Contact Bob’s Watches today for information on finding this beautiful and distinctive Rolex.